Gabriel Kahane performing at the MATCH as part of Aperio-Music of the Americas season closer. 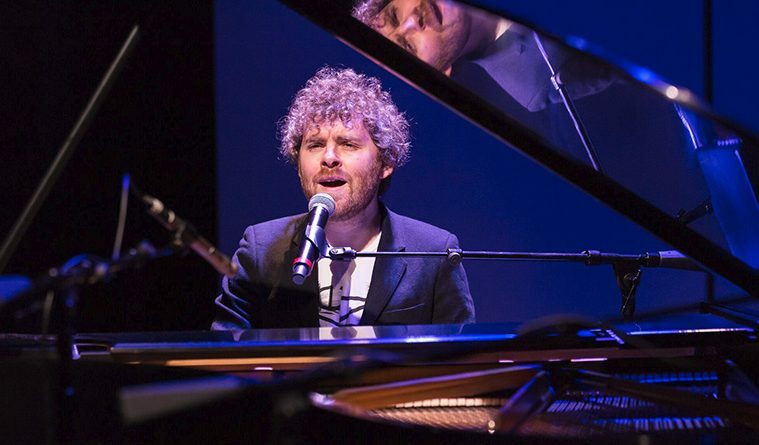 Gabriel Kahane has a lot to say. He wants to tell you about Latasha Harlins, the 15-year-old girl shot to death by a shopkeeper days after the Rodney King beating in LA; he wants to tell you what he discovered when he left his smartphone behind and hopped on the train after the November elections, traveling 8000 miles cross country, talking to the people he met; he wants to tell you about the neurotic and lonely people; he wants to tell you about falling in love, that being in love today is not much different than being in love in 1840. Kahane is a Brooklyn musician, of the singer-songwriter variety, who is so musically omnivorous that he can tell a good story in any idiom with equal ease. 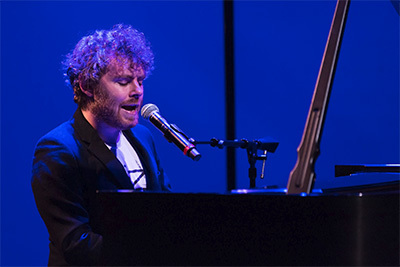 Houstonians have Aperio and its artistic director, Michael Zuraw, to thank for bringing to town one of the most sought-after, original musicians of our time, the versatile and emotive singer-songwriter Gabriel Kahane. 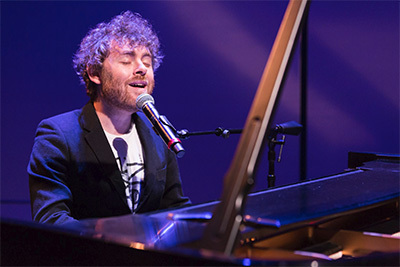 In the final appearance of his touring season, Kahane gave a solo show (just the man, a piano, and a microphone) in the still-intimate setting of the largest performance space at the MATCH. Kahane is a master storyteller, in words and in song. His jokes and anecdotes in between songs brought necessary levity to the heavy subject matter of the songs themselves, especially when he selected “Bradbury” and “Empire Liquor Mart,” two emotionally devastating songs from his critically acclaimed 2014 album The Ambassador, to share with the audience. The former paraphrased the dying words of the doomed robot from Blade Runner, who was programmed to experience life as a human, the latter is based on a true story from the LA riots of 1992, an expansive and moving tragic ballad of an innocent teenage girl shot to death in a corner convenience store. It’s good thing that Craigslistlieder, the comic song cycle that propelled Kahane to cult status more than 10 years ago, is still regularly a part of Kahane’s performing repertoire. 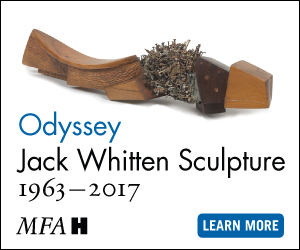 It may not be his best writing, but it definitely induces plenty of uncontrolled laughter and a bit of shock to those new to the work. Using the musical language of classical art song, and clever, idiomatic piano writing mixed with Broadway, cabaret, and pop characteristics, each of the eight songs that make up the cycle is an actual Craigslist Ad. From raunchy and gross to psychologically disturbed, Kahane uses what appears to be laughable to tell touching stories of hapless love and piercing loneliness. We are thoroughly entertained at the moment, but become thoughtful upon reflection. Robert Schumann’s Dichterliebe (The Poet’s Love), composed in 1840, is one of the most enduring and celebrated song cycles in the classical repertoire. Every great tenor or baritone has put his own stamp on the piece, from Wunderlich to Fischer-Dieskau to Bostridge. Kahane’s version is not about technical perfection or classical vocal tradition. He accompanies himself, as a singer-songwriter does, and sings with a microphone. Afterall, Dichterliebe is an age-old story about a boy who falls in love with a girl, and all the heartache, bitterness, and hopeless despair that come with lost love. Schumann dealt in the Romantic language of flowers and nightingales, fairy tales and dreams, but the story is the same, and Kahane brought out the hyperbolic melancholy and sense of irony in the text with his emotionally direct delivery. The vocal colors are purely pop, yet supple and balanced; the expressive phrasing delineates thoughts with clear intention; the piano playing is entirely effortless. Kahane referred to Dichterliebe as “German Emo” before he began, and as such, he defined Emo perfectly with his introspective, confessional, and sensitive interpretation. It is easy to fall in love with Kahane’s music. It speaks so directly to the heart. He gave the audience a sneak peek into his upcoming album, singing a song called Sweetbread and Liver, inspired by stories from the road–yes, the road he traveled by train after the election. He has his finger on the pulse of our times. He has his heart in making music that tells the stories of the people. I can’t wait to hear more. Sing me another, Mr. Kahane. Sherry Cheng is a music educator, free-lance pianist, and artistic director of the HCC Chamber Music Series.